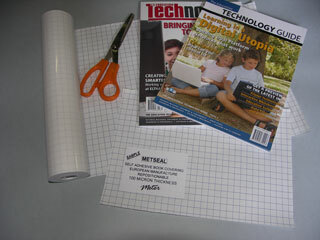 Metseal 15 metre rolls 100 micron Self Adhesive Book Covering. Metseal is a clear polypropylene self-adhesive book covering material for covering books and other publications that require protection. Metseal 100 micron Self Adhesive Book Covering is a PREMIUM GRADE LIBRARY MATERIAL and is superior in quality to many other films currently available. It is highly durable and easy to use, and importantly METSEAL is initially repositionable. This enables the correction of mistakes and the removal of air bubbles. Grid marked release paper assists in the covering process and allows easy alignment of books. All Metseal product is guaranteed and because it is made from polypropylene it won’t damage the environment. Great for use with Meter HARDCOVER-Rigidcover. Please call for more information, prices and free samples.